One thing I hate above most things, in Oscar Wilde style, is to have to change out of my pajamas and step out to buy grocery on the days when nature reminds me I am a woman. And when you have a toddler in the tow, whom you can neither leave at home since there is no one else, nor want to take with you since the tantrums he might throw, the prospect of going out looks the bleakest. So I avoid it as much as I can, making sure beforehand that such a situation will not arise. No matter how prepared you are though, sometimes fate just catches up with you. And so it was, on a sweltering May afternoon, when the sun was busy sucking every drop of humidity out of Pune’s soil, I climbed on to the elevator, the kid holding my little finger, and my lips relentlessly cursing me for having forgotten to buy the extra milk. The pain in my back was becoming so excruciating that I could have lain down on the lift floor and my eyes were ready to shed out tears any moment, but then, I did realize that crying was not going to lead me anywhere. So taking a deep breath, and telling to myself, let’s enjoy this, I stepped out of the lift, a smile on my face and walked towards my scooter. When I decide to do something, I do it thorough and complete. Now I had decided to enjoy, so I thought, lets make this a shopping expedition. As I parked my scooter in the market’s parking space, my eyes fell on the brand new provision store that had opened. It was almost a supermarket, but not yet there. However it looked swanky and inviting enough for me to let myself into it. I ambled along the three short rows of shelves, picking up things I needed and didn’t really needed, forgetting for the moment that I had stepped out to just buy milk. The son too had a gala time, loading the trolley with all the chocolates and goodies he could lay his hands on. After thirty minutes I stood at the counter with a trolley full of items, awaiting my turn. I was thinking how well the shop had been done up, when something flashed in front of my eyes and drove away all other thoughts from my mind. What was that? A dark, toned arm with a rather unique tattoo. I had seen that tattoo before! If only I could remember where! I peeked out of the queue to get a good view. The hand belonged to a rather stern looking, well built man, with jet black hair. Had I seen him somewhere? I looked closely again. Now his face seemed to be familiar. I racked my brain to find out who he was. Why did I remember his tattoo? The queue by then had shortened, and now there was just one person left in front of me. As that person looked for change in his purse, the man at the counter turned his head towards me, asking for my trolley. One look at my face, he seemed to freeze on the spot. His eyes widened, his jaws dropped, as his gaze shifted from me to my kid. He turned a deep scarlet then abruptly left the counter, even as the person before me called out to him to hand over the change, before leaving it on the counter and moving away. That was when it struck me. Of course, he had so much hair now, as opposed to the shining scalp he used to sport before. On second thoughts, it probably was a wig. That was why I had difficulty remembering. That tattoo was the clincher though. It was an ornamented N. N for Neelima, the girl for whom he had ditched me. When I had first seen that tattoo, I had been on my bed, with him over me. At that time, he had told me, N stood for notorious, which is what he prided in being. Well, back then, I was N for naive, and so I completely, foolishly, believed him. I finished paying up for my purchase to another man at the counter and came out of the store, now in a hurry to reach home. Once home, and the son happily settled with his new goodies, I dialed Sarita’s number. “I saw Manav today! At a department store near my house, working there!” I said. To say I had been devastated when I found that he was only fooling around with me, while his real interest was Neelima, would be a severe understatement. If not for Sarita’s encouragement and constant urging to move on, I would have lost myself. Might have even attempted suicide, but then Sarita made me realize that my life was too precious to lose over such jerks. So slowly, painfully, I had moved on, so farther away that after a while it made no difference to me whether he existed or not. Last I had heard, he had taken over his father’s business and was happily traveling around the world. I had, long back, even seen pictures of him and Neelima and their kid on Facebook. I had long back stopped looking for news of him, or even bothering to think about him. Sarita told me that his extravagant lifestyle had finally reaped its result. The business was gone, his parents dead, and his brother had disowned him. Neelima had left him and gone back to her parents, and later had been married to a rich but middle-aged cinema director who wanted a trophy wife to show-off at the ceremonies and didn’t mind the kid that came as an attachment. Penniless, probably he had now ended up in that department store, kicked along like a rolling stone by destiny. Strange are the ways of fate. From love to hatred, which had eventually simmered down to an indifference, my feelings for him had undergone a drastic change. Yet, I could not discern what I felt for him now. Pity? No, not really. A nonchalance that one feels nowadays when reading about yet another scam maybe. The son had started pulling me to the bedroom. It was his nap time. I picked up my little hero and marched away, all thoughts of the tattooed hand and its owner forgotten. Good one Yamini 🙂 It is indeed shocking when one faces their past. Thank you Sugandha. Life always follows the rule of what goes round comes around. Nice take on the prompt. Jerks like him deserves that. Thanks Sheetal. Life has its own way of settling accounts isn’t it? I actually think I got my inspiration for my WoW post from this, lovely story though, loved the entire narrative bit of it. Creativity is nothing but a Chain of ideas generated from one another isn’t it? Glad you liked it. Thank you Rachna! Well written…:) I guess on has to move on. Ppl will always get what they deserve. Thank you Preethi! And rightly said. 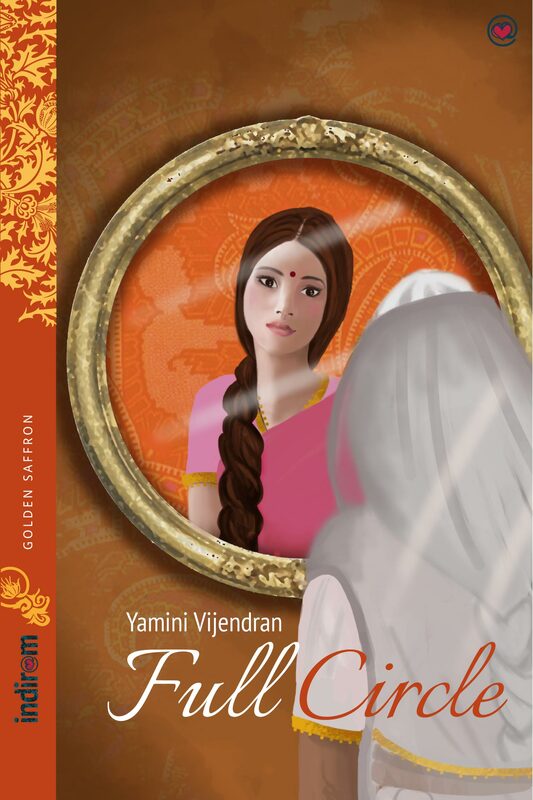 That was superbly done, Yamini! To bring characters to life in such a short story is not easy and you have made both of them seem like real people with consummate ease. 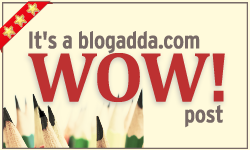 I agree with Blogadda. It is a “Wow” post. Glad the lady in the story had moved on. Glad her friend had saved her from suicide.